Radar waiting in his crate for his departure treat. Note the drool bubble! I work with foster dogs and I ALWAYS crate train my fosters. Granted most are adults when I get them but I have used the same process with puppies. I make their crate the BEST place on earth. 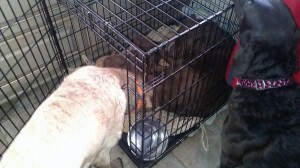 All of my dogs are fed in their crates ALWAYS! 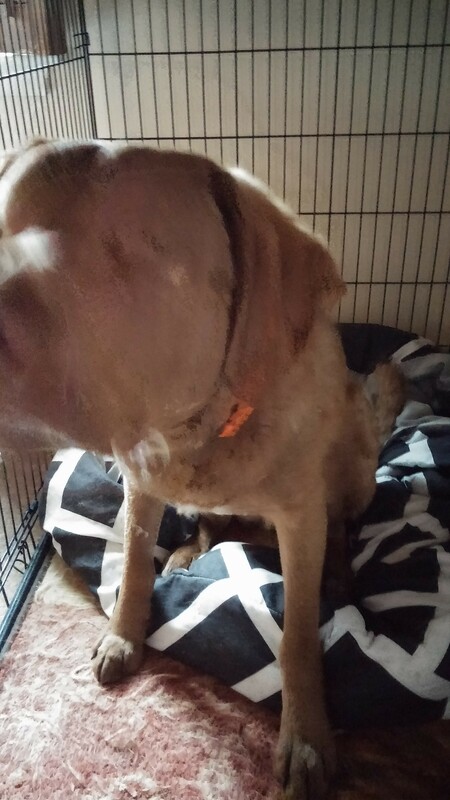 They get Kongs, bones, snacks, everything food related in their crate – no exceptions. Toys – My dogs have special, durable, highly coveted toys that are Crate Only toys. These are toys such as Kongs, Nylabones and raw beef femur bones stuffed with frozen bananas or peanut butter. These are toys they only get to play with in their crate, never outside of their crate. Familiar Scents – With puppies, I add a t-shirt that I have slept with in the crate with them. I will also do this with a foster if I send them to boarding or when they leave for their new home. Each dog has a blanket or quilt, unless they are destructive and then I take the blanket away until they settle into the routine. Louie will often crawl into a crate for nap. This happens to be his crate but he uses all of the crates for napping. Crate Location – I have crates in each room on the first floor of my house, of course I have several dogs. I also have to segregate new fosters so having a crate in each room allows them to be with us but everyone is safe. 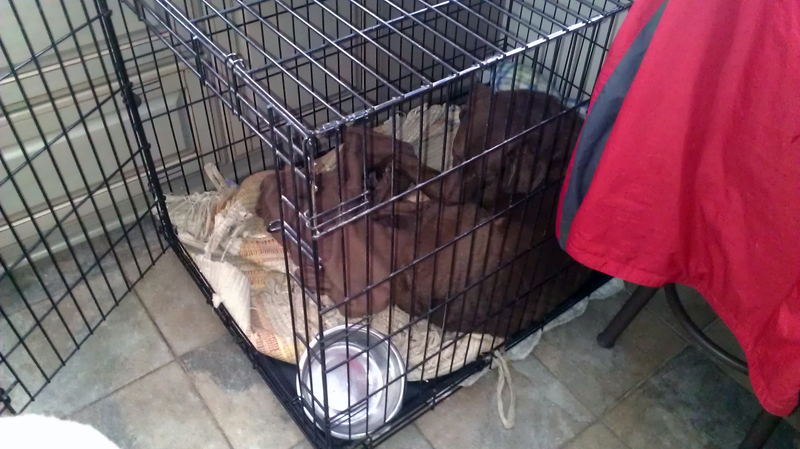 Each dog has their designated crate for eating and housing while I am away from home. However all the crate doors are open and they go in and out of each crate at will, except at meal or treat time. In fact at treat or meal time each dog FLIES to their designated crate and waits for me to deliver the food. Wire or Plastic – It is a preference of both the dog and the owner. I use wire because they provide more ventilation in the car, they collapse and store flat. 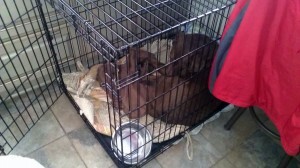 Some dogs are more comfortable with solid walls so I will experiment with a blanket or towel over the wire crate. 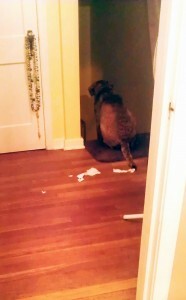 I also play classical music throughout the house when the dogs are crated as it helps calm them. This not encouraged but it often happens. In fact Louie will often grab his door with his teeth and close it so Radar cannot join him inside! Louie will also close his crate when he leaves to make sure Radar does not go in there to nap. Patience and Consistency – Crate training takes time and I do not think the crates need to be in one location. Once my dogs are crate trained, they will go inside any crate I tell them to with a simple pointing of my finger and “Kennel” I have one dog that “lives” in a crate in the dining room but sleeps in an open crate in the kitchen because that is the center of activity. I would say choose your place or places (I can get Giant size wire crates for $99 at the local farm supply store) and have one in each location.